This two-in-one hair cream creates a beautiful, thick look. 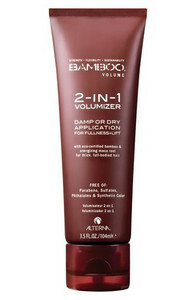 Use it as a cream for all-over, smooth, natural-looking fullness or as a paste to get textured volume and lift. Great for all hair lengths yet ideal for shorter hair, the result is increased stylability and touchably soft strands. Bamboo® Volume 2-In-1 Volumizer is made with eco-certified bamboo and strengthening maca root for thick-looking, full-bodied hair.